'Listen, Stranger!' 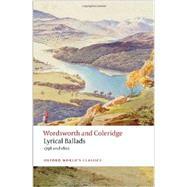 Wordsworth and Coleridge's joint collection of poems has often been singled out as the founding text of English Romanticism. Within this initially unassuming, anonymous volume were many of the poems that came to define their age and which have continued to delight readers ever since, including 'The Rime of the Ancient Mariner', the 'Lucy' poems, 'Lines written a few miles above Tintern Abbey', 'A Slumber did my Spirit seal' and many more. Wordsworth's famous Preface is a manifesto not just for Romanticism but for poetry in general. This is the only edition to print both the original 1798 collection and the expanded 1802 edition, with the fullest version of the Preface and Wordsworth's important Appendix on Poetic Diction. It offers modern readers a sense of what it was like to encounter Lyrical Ballads for the first time, and to see how it developed. Important letters are included, as well as a wide-ranging introduction and generous notes.